With the Pacific Ocean cooling off after a near-record El Niño, signs are pointing to an impending La Niña - the flip-side of El Niño. So, what are the odds, and if one does develop, how strong could it be? We look into it. If strong La Niña forms, here's how it will impact the U.S.
Monday, May 23, 2016, 8:00 -	With the Pacific Ocean cooling off after a near-record El Niño, signs are pointing to an impending La Niña - the flip-side of El Niño. So, what are the odds, and if one does develop, how strong could it be? What is La Niña? | What is El Niño? Ever since El Niño 2015 reached its peak in November, forecasters have been anticipating its eventual dissipation, and there has been keen interest in exactly how that will proceed, as a strong El Niño frequently leads directly into a La Niña. This El Niño hasn't been making things easy, however. As of the mid-March analysis by forecasters at Columbia University's Earth Institute, the odds of seeing a La Nina or having some mix of El Niño and neutral conditions developing by the end of the year were still fairly even. It has only been at the latest forecast update that the chances of a La Niña developing jumped to over 70 per cent. As a result of that significant jump in probability, while the El Niño Advisory continues due to current conditions, NOAA forecasters have issued a La Niña Watch, based on what they're seeing in computer model runs. Conditions are now expected to be "neutral" by late spring or early summer, and will very likely transition into a La Niña by late summer or early fall. As for the potential strength of an upcoming La Niña, should one develop, history can give us some insights. From the timeline above, La Niña conditions (anything -0.5oC/-0.9oF or lower on the scale) follow El Niño conditions (anything +0.5oC/+0.9oF or higher) in most cases, but not always. Also, the strongest La Niñas do not necessarily follow the strongest El Niños (or vice versa). There does seem to be a correlation between significant patterns, though. Thus, after the pattern swings significantly in one direction - either a strong, sharp peak or a prolonged event - there tends to be a significant counteraction in the opposite direction. With the current El Niño having matched the overall strength of the strongest pattern in the record books (from 1997-1998), from just a glance at the similar El Niños from the past, it's easy to see how something significant should develop later this year in response. While there is still the potential for this El Niño to have a few surprises in store for us, given the greater certainty of the latest forecast, the questions are shifting from "when will the El Niño be gone?" and "will there be a La Niña?" to "how strong will the La Niña be?" and "how long will it last?" As it stands now, it's too early to tell exactly how strong of a La Niña we could see by fall, or how long it could last, but based on the past, the pattern could develop along a few different paths. It could swing sharply into a record-breaking La Niña. This is what happened in 1988-1989, after the strong, double-peaked El Niño in 1986-1987. It may produce another multi-year La Niña, like there was following the sharp, very strong El Niños in 1982 and 1997. It could also result in a combination of the two - a record or near-record event in both strength and duration. Some forecast models - shown to the right - favour conditions that swing back towards an El Niño (and one even takes that to an extreme), but that's fairly unlikely. Most others indicate a La Niña, with one - from the Scripps Institution of Oceanography - even dropping off the deep-end of the scale leading up to November. That Scripps result is as unlikely now as the return to El Niño conditions, but that's the benefit of ensemble forecasting. Regardless of the "scatter" shown in the individual results, reality will likely play out somewhere in the middle. The most likely outcome, based on the current look, is a moderate to strong La Niña - somewhere in the -0.9oF to -2.7oF range - by January. After such a sharp spike during the El Niño, the pattern is likely to last for at least a few years, and there's even the potential for it to match - or possibly exceed - the 1999-2001 La Niña in strength and duration. However, as Robin Kovach, a research scientist with NASA's Global Modeling and Assimilation Office (GMAO), said in March: "This current El Niño has been different so it will be interesting to see what happens in the next forecast and the coming months." What will this mean for the U.S.? With La Niña installed in the tropical Pacific, we should expect a more active storm track, above normal precipitation and cooler weather over a wide sector of Pacific Northwest. Positive precipitation anomalies would also extend through the Intermountain West, and across sections of the north plains into the Great Lakes region. The south would experience a very different story than what they have been through these past 6 months with El Niño. Drier and milder weather conditions would extend from the Four Corner states across the South and Central Pains all the way to Florida. Will La Niña enhance the 2016 Atlantic Hurricane Season? It´s all about timing with this one, since the majority of model predictions are leaning towards a transition from the decaying El Niño, to a growing La Niña occurring right in the middle of the 2016 Atlantic hurricane season. With that factor in mind, the prediction gains some uncertainty, especially because it is being made this early in the year. 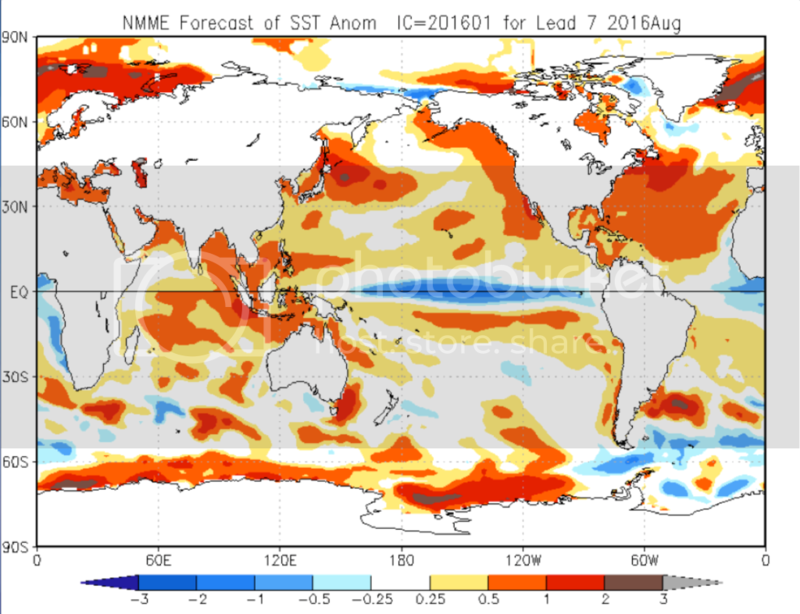 NMME model prediction of Sea Surface Temperatures (SST´s) for August 2016 showing La Niña forming in the Equatorial Pacific. We know from past El Niño and La Niña experiences, that when this relay between ¨Niños¨ happens during the summer months, smack in the middle of Atlantic hurricane season, anything can happen. If we take a look at the 1997-98 El Niño (one of the strongest on record and similar to the 2015-16 El Niño) which was followed by La Niña in summer, we find that the hurricane season that year was enhanced, with 14 named storms, 10 hurricanes and 3 category 3 or above storms. According to recent predictions by the Department of Atmospheric Sciences at Colorado State University, the 2016 season could turn out to be average, with 12 named storms, 5 hurricanes, 2 of them becoming category 3 or higher. Despite the uncertainties related to the timing of the arrival of La Niña, some studies have shown that during La Niña or when conditions are neutral in the tropical Pacific, the chance of a U.S. hurricane impact increases considerably. Beyond how La Niña behaves in the Pacific, we will also have to keep an eye on the evolution of sea surface temperatures over the Atlantic and wind shear predictions over the region where most of these storm breed. 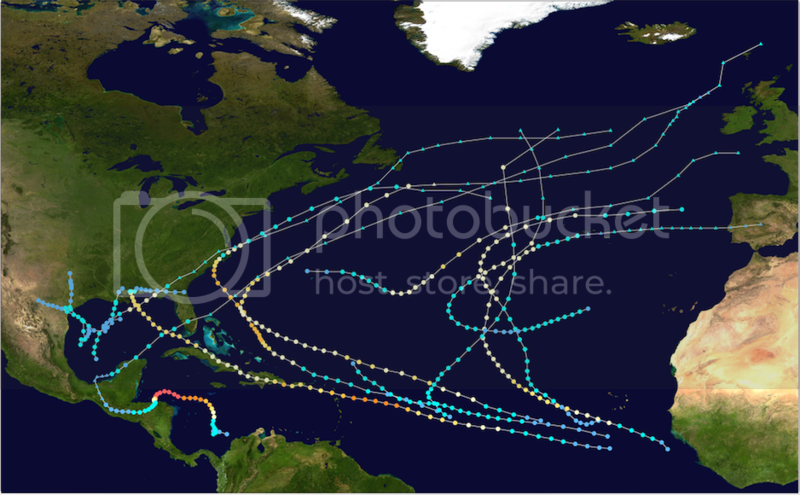 1998 Hurricane trajectories in the Atlantic during La Niña. 1997 was the year of one of the strongest El Niño´s on record. Watch below: Dr. Doug and Jaclyn Whittal discuss how El Niño will continue to impact us this summer.